Learn more about those items tucked away in your closet or collecting dust on your display shelves! Bring them to the Steele Auditorium at the Heard Museum during our semi-annual American Indian Art & Artifacts Appraisal Day, presented by the Heard Museum Council. 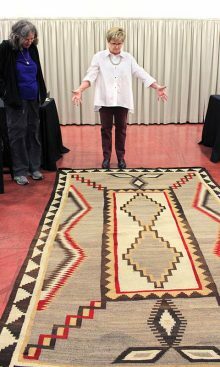 Leading Native art traders will examine your treasures, including baskets, textiles, pottery, jewelry, carvings, paintings, sculptures and other Native art forms and offer information about materials, dates, artists and traditions. Will you be the next visitor to find that your old Navajo rug is worth a small fortune? Or that the 1850s-era deer skin dress that’s been in your family is now valued at $70,000, as one amazed owner learned during a past appraisal? Or, in another appraisal, that a basket used as a trash can was determined to be an 1880s-era Apache basket was valued at more than $20,000? What do the Experts Evaluate? The Statement of Estimated Value which you receive with each appraisal is the experienced evaluator’s estimate of the price for which you could presumably replace your object, preferably somewhere between wholesale and retail. Of course, due to the unique nature of art, an item may not be exactly replaceable. In general, retail price would be what you would expect to pay for your object if you were to buy it at a reputable retail store. Wholesale price or auction price would be about 40 to 50% of retail price. The Statement of Estimated Value is not for insurance purposes. Appraiser Deborah Neal with a collector. Limit 10 items per person, please. Heard Museum members pay $5 less per item.